When Annick Goutal launched Tenue De Soirée, I knew that I would be in for a real treat. Opulent and gourmand yet youthful and fun, this is a stunning, contemporary take on a chypre fragrance with notes of iris and patchouli. If I could liken the scent to any other, it would be a modern day Gucci Rush… now theres a throwback for you! Inspired by the exciting feeling of what is to come following a night in Paris, Tenue De Soirée encapsulates the elegance and power of a woman who is getting ready for a night out; choosing her favourite tenue de soirée (or evening dress!) and spritzing on her favourite, empowering fragrance. Tenue de Soirée is unlike anything else from Annick Goutal; it set out to be a manifesto of audacity, a perfume of liberty and that it certainly is. As with the fragrance itself, the bottle style is new to Annick Goutal and provides a beautifully opulent yet fun contrast to the styling of their other perfumes. 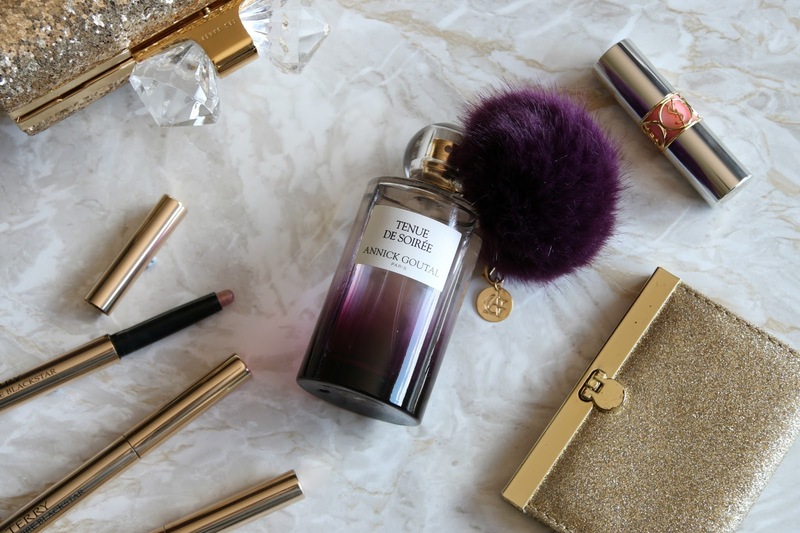 I love the purple gradient glass bottle that was inspired by the sky at dusk, the detachable rich purple fluffy pompom inspired by the puffs on vintage compacts that adds a whimsical touch to the aesthetic of the perfume and the luxury touch from the dangling gold medallion. This gold accent is actually stamped with the initials of the fragrance house. I love that Annick Goutal thought of everything when creating this fragrance as it hits all of the senses from smell with the perfume, sight with the aesthetic of the bottle, touch with the tactile pompom and also sound as the little gold medallion clinks against the bottle like two glasses of champagne. What could be more luxurious? 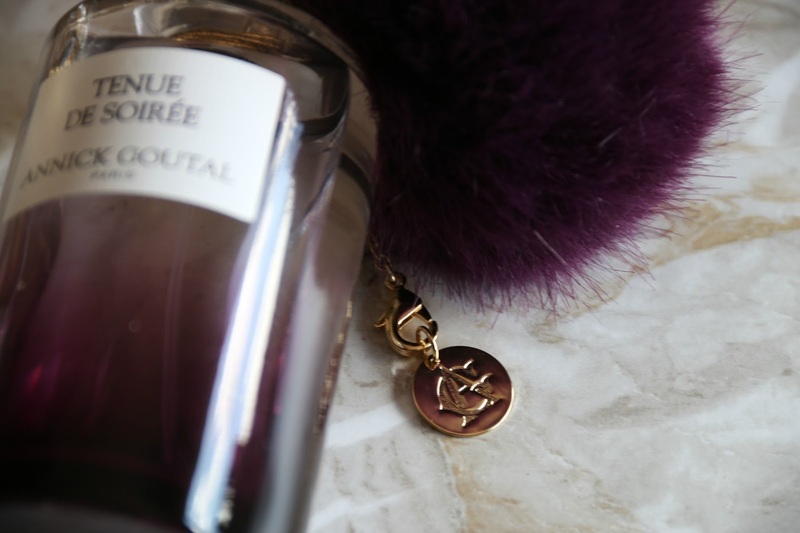 Tenue de Soirée is an addictive scent that I can wear it day or night, plus it lasts for hours before I need to top it up. I do find that as the day goes on, its scent is more noticeable to others than myself and I have had many compliments on since I started wearing it. If you’re looking for a delicious, elegant scent, pick this one up from House of Fraser for the 50ml and here for the 100ml, Selfridges and John Lewis. 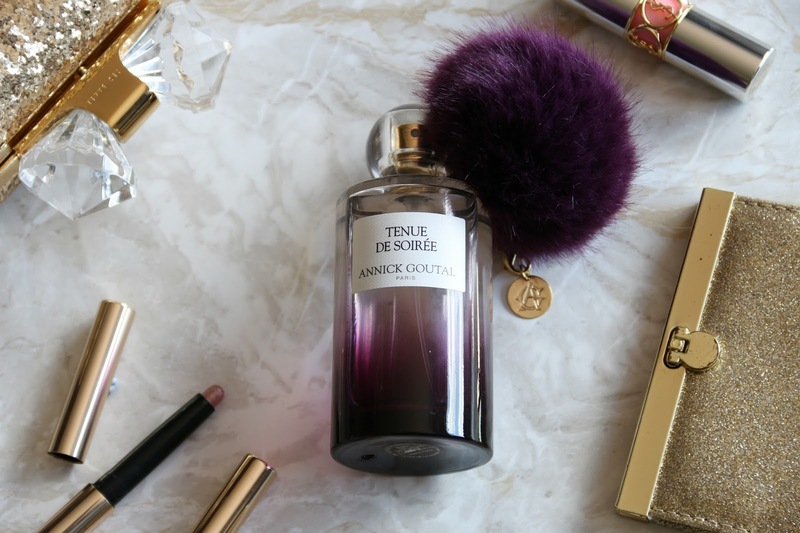 How does Annick Goutal’s Tenue de Soirée sound to you? What do you think of the packaging? Oh ive never smelled this, ive actually never even heard of this but will definitely get a sample when i head to House of Fraser! What an absolutely beautiful looking bottle and that scent sounds divine. I really need to try it for myself. I've been looking for a new spring/summer scent and this sounds like a great one to try. It sounds like they've really covered all of their bases from the fragrance to the bottle, and everything in between! I really do love a good pompom! I'll have to give myself a spray and see what I think next time I'm in the shops. I love the design of this bottle! The actual fragrance sounds great too, would love to try this out! I get in a rut with perfume so i never look at others. i love the little pom on it and it looks so elegant! I love when perfume lasts a while, nothing worse then having to top up constantly!